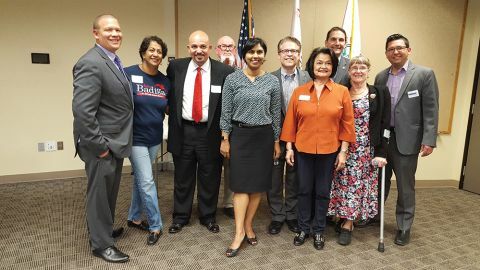 Rancho Cordova, CA (MPG) - On October 19 at the Rancho Cordova Luncheon organizers allowed local contenders for public office a strictly monitored two minutes in which to explain themselves and their candidacy. Here are some snippets from the candidates who attended. Inez Reyes has served on the Board since 2006. “We had to dig in, do hard work, get our hands dirty . . .,” Reyes said. “After working so, I will tell you we are in the best place that we can be now.” Reyes has focused on providing recreational services that unite the community and enhance the quality of living. Jaya Badiga has two children. “My biggest priority is socioemotional learning,” Badiga said, which involves empathy, confidence, and cognitive areas that prepare children to get along with each other. Badiga worked for WEAVE as managing attorney for 4½ years, battling to make women and their children safe. She acted for clients’ continued employment and steady schooling for their kids. Joshua Hoover has three small children. As policy director for State Assemblyman Kevin Kiley, Hoover advises Kiley, vice-chair of the education committee, on education issues. “I’ll share with you my number one priority,” Hoover said, “which is to close the achievement gap between Folsom and Rancho Cordova schools.” He would ensure budgetary resources go where most needed, increase parent participation, and incentivize great teachers to teach in Rancho Cordova. Ed Short is up for reelection, having served 16 years on the Board. Short talked about some of the many Board accomplishments of which he has been a part. “I bring no baggage to the table of public service, only my sincere desire to serve the best education interests of our children and thereby secure the future of all,” Short said. Andrew Grant. A Republican, Grant is a Marine, and attended the Naval Academy. He worked in intelligence, worked at the Pentagon, Homeland Security, and Department of State. He knows Washington D.C. “There is so much about what is happening in Rancho Cordova that is so important to all of District 7,” Grant said. Derald Langwell has attended around 90% of City Council meetings for the past five years. He is concerned about, among other things, personal property rights. “I see the City is kind of stepping where they shouldn’t be stepping,” Langwell said. He also would like to see sidewalks put into older residential areas. “We can get the kids out of the streets and onto the sidewalks,” Langwell said. Linda Budge has been on the City Council since its incorporation. “We are a place that’s known as the place that has more fun than anybody else,” Budge said. “Who all went to the air show? Who came to the City’s birthday party? And who came to the Park Districts birthday party?” It is important for the City Council to listen to what the residents of Rancho Cordova want, Budge said, as they have done when considering uses for Measure H funds. Candidates not able to appear were Brian Danzl, Senator Jim Nielsen, Philip Kim, Melinda Avey, Assemblyman Ken Cooley, Congressman Ami Bera, and Donald Childs.